There is a little mountain town….and on any given summer day you can visit this town and feel like you just stepped into a movie set. You will walk through this town and notice the historic storefronts with creative window displays, postage stamp gardens overflowing with lushness and color, Queen Anne homes dripping with details, and winding little streets that take you on spontaneous journeys where you will happen upon a hidden spring or forgotten staircase. All of these features make this town a little surreal and movie set-like but as you walk the streets of town…pay attention…you will hear background music. Yes…there is music playing somewhere…it doesn’t matter what day you visit. 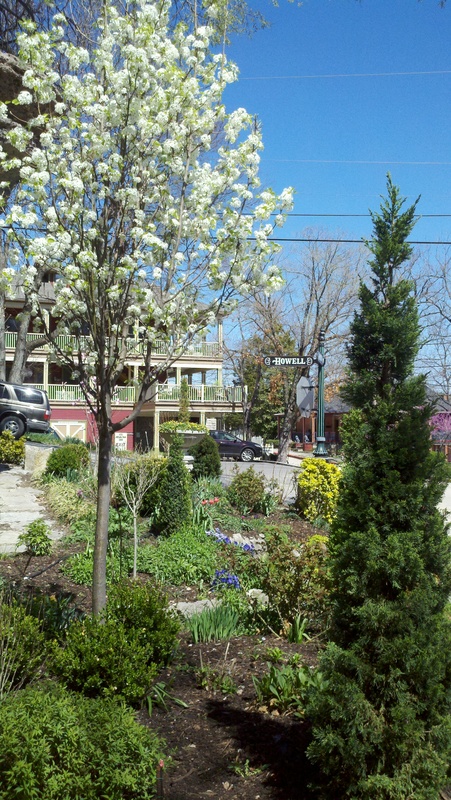 Eureka Springs has music playing somewhere everyday in June. Here are a few of my favorite upcoming events. Check out the Greater Eureka Springs Calendar of Events to see what is playing while you are in town. Enjoy a fabulous meal in the Crystal Dining Room of the 1886 Crescent Hotel and be serenaded by some of the stars of the Opera of the Ozarks. This is one of the classiest events I have ever been to. You don’t like opera? You will surprise yourself with this event. I can’t tell you how much fun it is. Also on the guest list…Elise Roenigk…owner of this Historic Hotel of America. For tickets call 877-342-9766. Brick Fields plays in Basin Spring Park from 1pm-3pm followed by Awesome Possum from 3pm-5pm. FREE. Susan Shore takes the stage with her engagingly offbeat performance from 1pm-3pm followed by Emily Kaitz and Outside the Lines at 3pm. FREE.